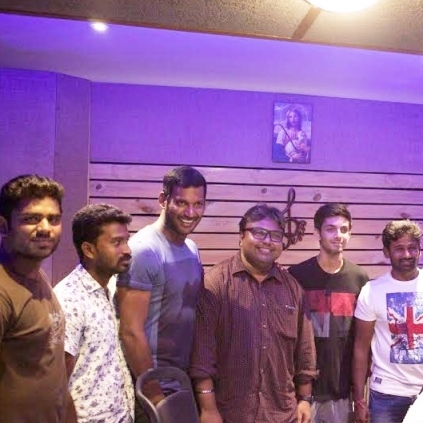 Youth sensation Anirudh Ravichander is touted to have rendered his voice for a catchy track in Vishal's upcoming film - Marudhu. With D Imman taking care of the music, one can surely expect an instantly appealing track from this duo. Reportedly, this song is a catchy rural extravaganza that will make the album stand out. Marudhu is directed by Muthaiah of Komban fame. Starring Vishal and Sri Divya in lead roles this project is bankrolled by Gopuram films. Apparently this venture will be released during the month of May, 2016 as a summer treat. Details awaited! The third film for a home production banner! Vijay 60 to begin with a Jithu Jilladi feel? Radikaa's comment about Nadigar Sangam's debt clearance! People looking for online information on Anirudh Ravichander, Marudhu will find this news story useful.